Is Blind Faith Extra Terrestrial for Blank Mind Fail Math? What does the term Blind Faith when used in a religious context really mean? 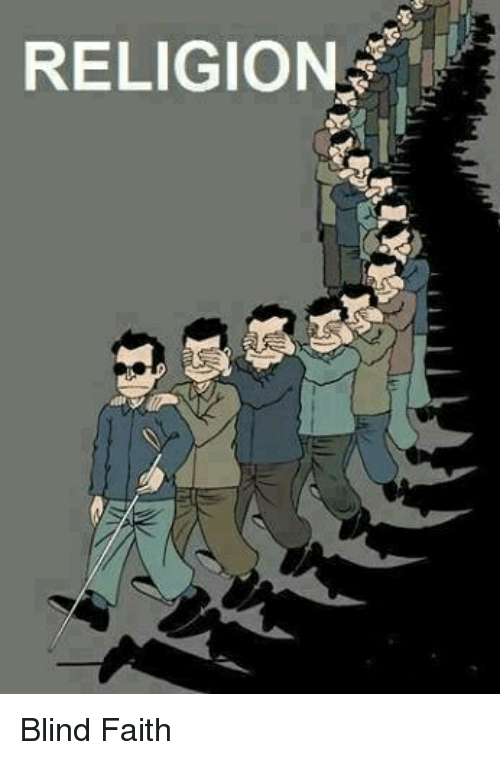 For most people who are religious, the term blind faith is a simple one. It is difficult enough to believe in the concepts being presented by religion and then to be challenged on them and have to explain them can be next to impossible as well as undesirable to have to do. So the term blind faith is a simple expression, an idiom that quickly allows them to justify their position without any explanation needed. Basically, it means that even though they can't see what they believe in which normally would be required for such extreme statements their faith is so strong that perceivable vision is not necessary. People who do not have as strong a faith cannot attain blind faith. Translated in alien blind faith meaning blank mind fail math means that a person can not see what is really going on (ie. their mind is blank) and are unable to figure out what is really going on (ie. fail math). So when you realize the Hetlau are here on Earth, at war with the EA, and enslaving them it becomes understandable how they place terminology like blind faith on the planet in order to easily keep people believing in impossible concepts. At the same time it is a hidden clue when revealed that will show the repeating patterns that provide a preponderance of evidence in the absence of corroboration. In other words similar to how blind people use braille to read what is going on EA can use an ET version of it and read what is going on by critically thinking. You are elevating your mind and/or awareness level to that of ETI and enabling yourself to tell your brain in ET what is really going on. Older PostIs Eternal Extra Terrestrial for Learn ET?